You can now buy a replica of Duchess Meghan's engagement ring — for $40! Can't get enough of that "Markle sparkle" since the wedding of Prince Harry and Meghan, Duchess of Sussex? Now you can own a replica of the former Meghan Markle's engagement ring for just $40! Buckingham Palace's online gift shop is selling the replica ring as part of their new statement jewelry collection and, suddenly, all is right with the world again. We've been admiring the beautiful ring Prince Harry designed for the Duchess of Sussex since they got engaged, but were bummed when Cleave and Company — the London jeweler who designed the ring — announced it wouldn't be making official replicas. Buckingham Palace stepped up and created a replica of the one-of-a-kind piece themselves, writing: "The design of this new statement range is inspired by the engagement ring of Meghan Markle." The ring is made of "sparkling crystals set on palladium-plated metal" and features an adjustable band. And while you can't borrow Princess Diana's aquamarine ring as Meghan did, you can buy matching earrings ($33) and a pendant ($40) as part of the collection. Even better news? Buckingham Palace's Royal Collection ships worldwide! 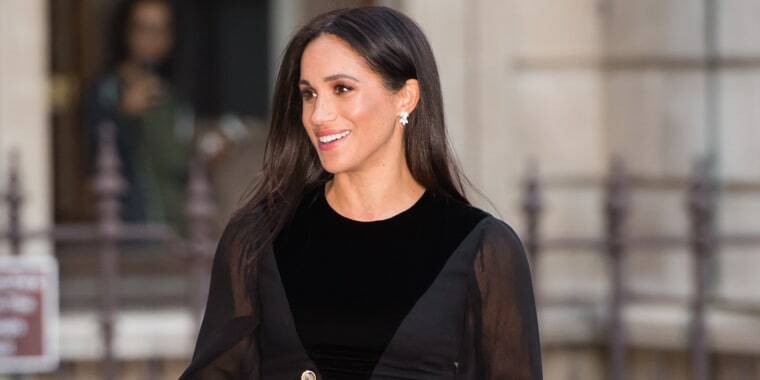 Replicas of iconic jewelry pieces like Meghan's engagement ring are hard to come by, and we'd be willing to bet this look-alike is going to sell out fast!